Lipper International provides exceptionally valued items for the kitchen, home, office, and child's playroom. Beautifully finished and incredibly sturdy, the Kids Collection from Lipper International is perfect for any child. Add a new dimension of fun and functionality for your children within any room of your home. Having sturdy design and rugged durability, our tables, desks, chairs, and toy chests provide children of all ages with colorful items well suited for play and creativity. The wide assortment of color and design of our Kids Collection will match any child's room and exceed expectations. 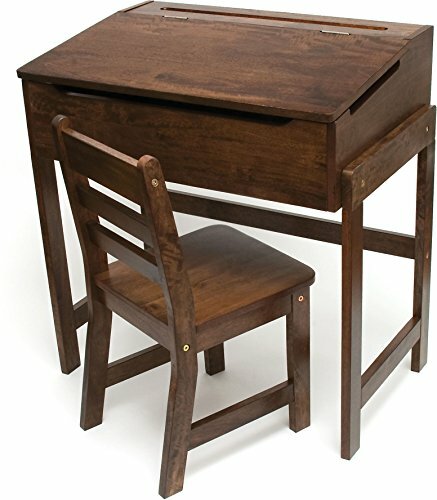 This Child's Slanted Top Desk is perfect for eager little students to spend their day writing out their ABCs and 123s on the chalkboard desktop. Lift up the top for a generous storage space for erasers, crayons, coloring books, and other treasures. It comes with 1 chair that fits with any decor and is perfect for little ones to use for schoolwork or playtime. Wipe with slightly damp cloth. Do not soak. Do not use soap. Dry immediately with cloth or towel. Do not allow to air dry. Product will warp if it is not dried immediately. Perfect for eager little students to spend their day writing out their ABCs and 123s on the chalkboard desktop - Fun and practical! Dimensions: Table (W x D x H): 25 1/2" x 16" x 26; Chair (W x D x H): 11 3/8" x 13" x 23 5/8"; Chair floor to seat: 13 1/4"